Tests with human subjects require decades, and are impossible to control, so the gold standard for testing claims for treatments that delay aging is the controlled trial with rodents, usually mice. Each treatment is applied to about 50 mice for their 2-3 year life span, and an equal number of controls is housed in identical circumstances. The total cost for a single experiment can run over $200,000, and what we get for this is two full mortality curves, with and without treatment. You already know that aging research is the most cost-effective in medical science. Medical costs rise steeply with age, and delaying aging by even a small amount carries enormous benefits in avoided suffering, in lives, and in medical costs. Research on life extension treatments in mice is grotesquely underfunded by any reasonable accounting of costs and benefits. So there is a backlog of treatments that show promise, but we just don’t know yet whether they work. I’m going to list a dozen of my favorites and then propose a novel scheme for testing them at minimal cost. The proposal is to run a rough screening for important increases in lifespan, using a small number of mice, and later to determine the full mortality curves for only the most promising treatments. Further gains in cost-effectiveness can be realized by testing the treatments 2 or 3 at a time. This leaves a lot of disentangling for the statisticians, but math is cheaper than mice. And there is an important fringe benefit: What we really want to know is how to combine treatments to extend health span longer than is possible with any single treatment. Almost nothing is known about how various life extension treatments interact, and it’s high time we started learning. Where do these ideas come from? The most creative science is also the highest risk, and for that reason is underfunded in today’s economic environment. There are herbs and roots from traditional Chinese medicine and the Indian Ayurvedic tradition; there are experiments run in small, low-budget labs and experiments from Russian universities that will not be given credence until they are validated in Western labs. The ones I am featuring today are substances that I happen to know about, and the universe of promising treatments could be greatly expanded by any expert in Oriental medicine. A new database of life span studies has recently been announced, to be hosted at geroprotectors.org. There is an existing catalog of life span studies in animals at lifespandb.sageweb.org, which seems to be unavailable as I write this. Decades ago, Vladimir Anisimov of the Petrov Institute in Leningrad began testing purified extracts from pituitary glands for health and longevity benefits. In a lifetime of research, he has found many promising substances. At the top of the list is an extract from a region of the brain known as the epithalamus. The natural extract is known as Epithalamin. The active ingredient is thought to be a short peptide or micro-protein with just 4 amino acids, which Anisimov named Epithalon. In a series of experiments over the years, Anisimov finds life extension in rodents ranging from a few percent to 30%. Treating 70-year-old humans with the extract, Anisimov reports that their mortality rate is cut in half. This is a molecule akin to CoQ10, attached to a positive charge which causes it to be pulled into mitochondria. I have written about it previously here and here. The molecule was developed as a research tool in the 1970s by Vladimir Skulachev and Russian colleagues, and later was recognized for potential health benefits by Michael Murphey and Robin Smith in New Zealand. Skulachev has tested his product SkQ in mice and claims modest life extension. A New Zealand company began selling their version, called MitoQ last year, based on experiments that show improved wound healing and neuroprotective benefits in mice. Tomas André introduced me to Lapachone a few weeks ago. His French company has begun to promote the science on a web site, though they do not offer it for sale as yet. It is a tri-cyclic molecule extracted from bark of the Pau d’arco tree in the Amazon rain forest. In preliminary studies, it has shown potential promoting arterial health, as a cancer treatment and modifier of the energy metabolism. 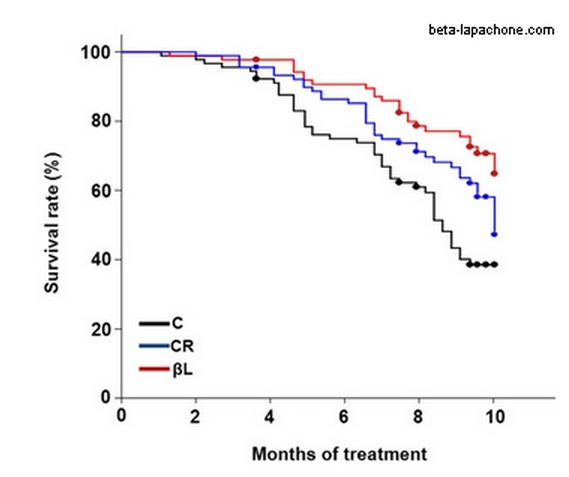 Most impressive is one study in which the survival curve of mice treated with beta lapachone seems to improve over caloric restriction. Autophagy is the name of the cell’s main clean-up process, eliminating accumulated wastes. Spermidine promotes autophagy, and is found in many foods. As an anti-aging agent, it has been championed by Frank Madeo of University of Graz. He reports dramatic life extension in worms and flies, and smaller life increases in life span for rodents. Metformin is a diabetes drug that increases insulin sensitivity and dramatically lowers cancer risk. Mice fed metformin live longer. Berberine is a naturally-occurring polycyclic molecule that reportedly has many of the same benefits. It is extracted from the goldenseal root, which has been used in Native American and other cultures as a natural remedy and has been championed by Jonathan Wright, In some studies, berberine improves on metformin both in its effect on glucose metabolism and in improving the lipid profile in the blood. Like metformin, has anti-inflammatory benefits, but it is not known whether it can slash cancer risk as metformin has been shown to do. Recently, concern has been expressed about increased risk of Alzheimer’s in patients taking metformin, and we don’t know how berberine might do on that score. Dinh lang is the Vietnamese name of a traditional herbal remedy. The Parkinson’s drug sold presently as Selegiline or Eldapril or Emsam began life with the name deprenyl. In the 1960s, it was studied by a Hungarian doctor named Joseph Knoll. In one of Knoll’s studies, dinh lang was combined with deprenyl, with the result that each separately extended life span in mice, and two together synergized so that life extension with both was more than the sum of the two separately. I have not seen other studies of dinh lang, and do not know where it can be purchased, or whether it has a place in traditional Chinese medicine. Pterostilbene is a chemical cousin of resveratrol. Both are naturally-occurring, with trace amounts in grapes, wine, blueberries and other berries. Both are a kind of natural anti-biotic, produced by plants as a self-defense when they are threatened by fungal infection. In 2003, Resveratrol made a splash in the press after an MIT lab discovered that it activated a class of SIR genes associated with longevity. There were high hopes for resveratrol when it was found to lengthen life span in yeast, worms, fruit flies and fish. Performance in mice, however, was disappointing, with life extension only for obese mice on a high fat diet. Pterostilbene appears to have similar activity to resveratrol, but it is much better absorbed and has greater affinity for its target, so it is used in smaller quantities. Pterostilbene deserves to be tested for life extension potential in rodents. This is the powdered leaf of a traditional Oriental medicinal herb, recently popularized by Life Extension Foundation, which promotes it under the name “AMPK Activator”. In human and rodent studies, it improves insulin sensitivity and lowers blood sugar. In studies with fruit flies, it modestly increases life span, but it has not yet been tested for life span effect in rodents. Glutathione is a first-line mitochondrial antioxidant, and it is the only antioxidant for which there is any evidence of life span extension. Unfortunately, we cannot absorb glutathione orally, and NAC has been promoted as the next best thing, as the body uses it to make glutathione. A study from Jackson Lab reports significant life span extension from NAC in male mice, but it comes with a warning about reliability of experimental protocol. Here is a study that reports that NAC can slow the loss of brain cells in aging mice. Curcumin is an extract from the curry spice turmeric that has been used in traditional Ayurvedic medicine. It is one of the best herbal anti-inflammatory agents, and has been found to extend life span in flies and worms. Based on epidemiology and cell cultures, a role in preventing Alzheimer’s Disease has been proposed for curcumin. Buckminsterfullerene is a spherical molecule made of 60 carbon atoms that was hiding in plain sight before being discovered in the 1980s. Based on one spectacular report of life span extension in rats three years ago, it has been adopted by people willing to experiment on themselves, who share their experiences, for example, on the Longecity web site. In some cases, we expect combining treatments to be a kind of duplication of effort. It may be that the net benefit of A and B is just A. For example, many of the treatments that are known to extend life span work through the biochemical pathway of insulin sensitivity and the glucose metabolism. There are only a few years of human life available from this pathway, and once we add those years, no amount of tinkering with the insulin pathway will get us any more. Conversely, if we can indeed address two pathways that are fundamentally different, then we expect positive synergies. It may be that the net benefit of A and B together is greater than A+B. We have a handful of interventions that reliably extend life span in mice: besides dietary treatments such as caloric restriction, protein restriction and intermittent fasting, there is rapamycin, metformin, aspirin, maybe TA-65, some short peptides and various anti-inflammatories. Very little is known about their interactions, and yet there are humans (some of whom read this column) who are not waiting for the data, but doing all these things at once. I think it is important both to gather information about new treatments individually, and to begin collecting information about how they combine and interact when applied together. So I have put together an experimental plan using pairs of treatments. Since the number of pairs is much larger than the number of treatments, I propose using a small number of mice for each treatment. For example, with 12 treatments, there are 66 pairs of treatments. If there are just 5 mice assigned to each pair of treatments, that’s 330 mice in all–a manageable number. This is a modest experimental effort compared to the potential for new information about 12 treatments and their interactions. With just 5 mice for each treatment pair, the statistical power for each combination is low. But there will be 55 mice receiving each one of the 12 treatments, so information is there, and the math can extract it. With so few mice, we will not be able to get the clean survival curves that have become the gold standard for testing treatments in mice. But with a technique called incremental multivariate regression, it is possible to untangle the data and determine which are the most promising treatments, and how they are likely to work in combination. I have begun to circulate this proposal with people who are best able to implement it, and others who are best able to find funding for the project. In coming weeks, I’ll let you know what happens. I’m not familiar enought with the methodologies of incremental multivariate regression to completely understand the approach you are suggesting, but this is a creative, very practical sounding idea! I still don’t get why you don’t endorse TA-65. You clearly state that lengthening one’s telomeres is a crucial step to improving aging function, yet you neither take the product nor do you discuss it during this post. To the best of my knowledge TA-65 is the only product that verifiably lengthens telomeres. So, what gives? TA-65 has already been tested and shown to extend mouse life span, and I was limiting the list to substances that haven’t yet been tested. Now that I say this, I realize that I included some that were tested and found to work with mice in Russia, and for this reason the Western research establishment has ignored the results. a) errors intrinsic to the biochemical method measuring the variable. b) errors due to the person performing the measurement of the bioch. parameter. C) other sources of errors. It is my experience at the lab (37 years already) that the minimum number of mice to get something meaninfull measuring biochem parameters in mammals under controlled conditions is n=8 (not 3). 3 can only be used as first approach to then go to repeat with n=8 at least. On the other hand, based on my 27 years of experience working at the lab on the MFRTA (THEORY OF AGING) I would never try ANY ANTIOXIDANT since I know well that what contributes to longevity is the rate of mitoch. ROS production, not the antioxidants nor the repair of endogenous DNA damage. Most of the positive results you mention in mice have been obtained on shortt-lived control mice only, so no good….. The “super-longevity mice” claimed live less than our control mice (eg. our 2014 Aging Cell paper on life-long singenic mice treated with atenolol: controls reached 3.9 years of age). What’s your view on supplements like MitoQ or SKQ1 (which is not yet available as a supplement)? MitoQ is designed to counteract ROS production inside mitochondria. However, one study demonstrated that MitoQ can participate in superoxide production, although this was only one in-vitro study. As I said – I think they deserve testing in mice. Preliminary results show modest promise, and the mechanism is different enough that we might hope for modest synergy. I would consider three additional drugs that have shown some life extension properties. All of them are FDA approved, so we take all the regulatory burden out of the way. This alone can speed up time to market several years; we will need the off-label approval though. Rapamycin and Metformin have already been shown to extend mouse life span. I didn’t know about methylene blue, and I will read more – thank you! I hope I didn’t leave the impression that I thought these 12 were the only substances worthy of investigation! Methylene blue is reportedly a “potent” MAO inhibitor (http://www.ncbi.nlm.nih.gov/pmc/articles/PMC2078225, http://www.ncbi.nlm.nih.gov/pubmed/22197611) at certain doses, as with selegiline/l-deprenyl, and may also work in other ways. In regards to telomeres, I’m curious if you read Aubrey De Grey’s recent comments in Gigaom and what your thoughts are / response is? “A lot of our cells are simply incapable of division, because of the specialization they have adopted, like neurons, for example, and so a lot of our cells are capable of division, but they only actually divide very occasionally, when they’re called upon to do so, because of some kind of injury. “There are only a very small number of our cells which divide regularly throughout life, and frequently throughout life. So it’s actually not clear that the problem of shortening of telomeres really matters all that much in most aspects of human aging. However, what we can say is that the lengthening of telomeres is itself a problem, in one major effect of age-related disease, namely cancer. But both Judy and Aubrey have yet to face the radical truth that telomere shortening is a death program, and it has been ever since the first cilliates, about a billion years ago. I was curious a while back about the supposed telomerase-cancer connection and read a significant amount on the subject. I’m no expert, but I have to agree that the evidence (and logic) are in your favor. This is contrary to all that I’ve read so far on longevity (namely that maintaining telomere length is essential). I feel confident that telomerase will add years to our lives, but I don’t think anyone knows how many years. One hint comes from removing senescent cells in mice. They live 20-30% longer. A less optimistic estimate comes from the large Danish survey of telomere length and mortality last spring. I wrote in April that this study can be extrapolated to a prediction of just 5 years for humans. 1) If cells do not divide there is no shortening of telomers. 2) The cells most important for aging are those that do not divide (the post-mitotic ones) like most neurons, cardiomyocytes and skeletal muscle cells. But that would potentially ruin Big Pharma. With their “cure is better than prevention” mantra, this is not going to happen anytime soon.Big Pharma don’t care about curcumin, Q10, milk thistle or any other natural substance, which can prolong life and potentially make aging less risky that it currently is. The reason is simple. These natural compounds cannot be patented. They are widely available and relatively in-expensive. Big Pharma doesn’t wish to cure anyone…revenue streams cease when patients are cured. All big pharma wishes to do is “manage” symptoms (i.e. lowering measurable cholesterol levels with statins, which will have a negligible impact on heart attack risks, but make the patients feel like their health issues are being treated), which leads to long-term/life-long prescriptions that keep the revenues rolling in. I’m not meaning to be snarky here, just questioning the use of “cure” and “Big Pharma” together in the same sentence. I do not have experience in a lab so please take my comment with a grain of salt. I have done quick search on mice prices and concluded that even with a 1000 mice the costs would be quite manageable. It could be around 20 thousand USD for the first year or so. There would additional ongoing costs of course. In todays economy, and creating a compelling story around this topic (like you just did in the article) you could easily croudfund this research. Lots of experiments, books and new technologies are created this way, why not longevity? I’ve heard widely-varying estimates about how much it costs to keep mice in standardized environments. I’ve been reaching out to Steve Spindler (UC Riverside) who has the best record for experimental design with mice that gives consistent results. Because his scatter is narrower than other labs, we would need fewer mice. But his cost per mouse per day is high. I would add that MAO produces H2O2 (a potent source of most damaging ROS hydroxyl radical OH. etcetera) as consequence of its enzymatic reaction. That´s important quantitatively in certain cells rich in the enzyme like those of substantia nigra (involved in Parkinson´s disease). Therefore, part of the mechanism of benefit from MAO inhibitors like selegiline or methylene blue could be that they inhibit H2O2 (free radical) production. My interest in metformin is longevity evidence. Is there any evidence with these alternatives that they act in the same way?